In the past four months, three confrontations have occurred between China and Indonesia over the presence of Chinese fishing vessels in waters near Indonesia’s Natuna Islands. By compelling Jakarta to adopt a more active approach to defending its waters from Chinese encroachment, these incidents may transform the dynamics of the South China Sea disputes. Equally importantly, however, statements by China’s Ministry of Foreign Affairs (MFA) regarding these incidents provide clues about the content of China’s maritime claims in the South China Sea. Specifically, China appears to be moving toward justifying some of its claims in terms of historic rights, not based on any land feature as required by the United Nations Convention on the Law of the Sea (UNCLOS). 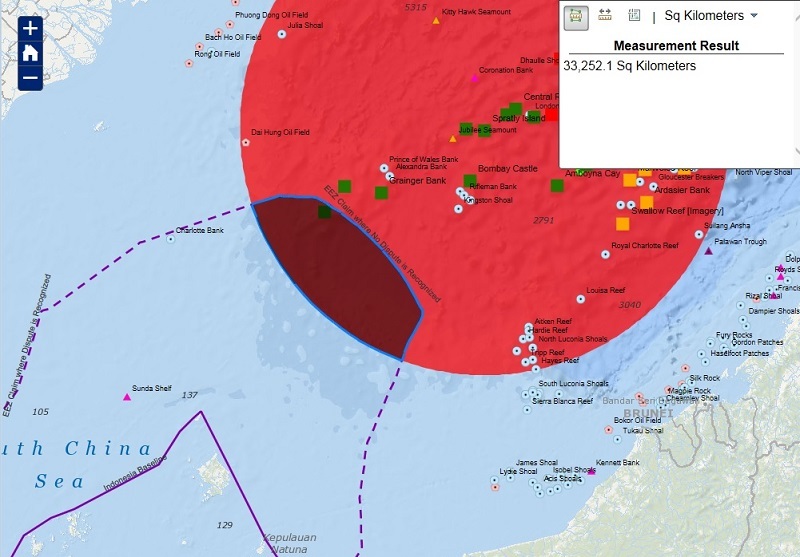 Explore the Indonesia-China maritime boundary in this stand-alone interactive map. Access the full map here. These remarks help illuminate China’s claims in the South China Sea for several reasons. To start, Hua stated that a conflict over maritime claims exists between Indonesia and China. Although the MFA has occasionally described the waters near the Natuna Islands as China’s “traditional fishing grounds” (in June 2009 and March 2016), it has never identified an explicit conflict with Indonesia over maritime rights in the area (though such a conflict may have been implied). Likewise, Indonesia has maintained that no dispute exists in the area in order to preempt and delegitimize any explicit Chinese claims based on the nine-dash line. As shown below, the area of conflicting maritime claims that Hua described could be as large as 94,000 square kilometers. 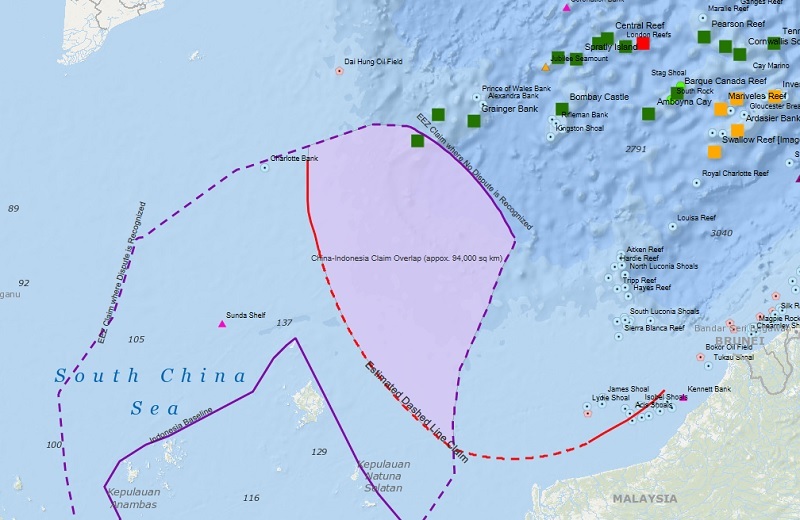 This calculation assumes that China’s traditional fishing grounds are bounded by the nine-dash line and the 200 nautical mile (nm) EEZ that Indonesia claims from the Natunas in the South China Sea. (The extent of Indonesia’s EEZ was taken from the 2015 maritime zones map produced by the Badan Informasi Geospasial.) Within part of this area lies Indonesia’s East Natuna gas field, with 46 trillion cubic feet of proven reserves, underscoring the potential stakes in China’s claims. Map showing overlap between hypothetical closure of nine-dash line and Indonesia’s claimed exclusive economic zone. In addition, China’s claim to traditional fishing grounds is inconsistent with UNCLOS. The convention’s cardinal principle is that the land dominates the sea. Claims to maritime jurisdiction must be based on the ownership of land features. As China recognizes Indonesia’s sovereignty over the Natuna Islands, any Chinese claim to maritime rights such as traditional fishing grounds would have to be based on an island in the South China Sea that could generate a 200-nm EEZ. Spratly Island, which China claims but Vietnam occupies, is the only insular feature in the area that might meet the requirements for an island under Article 121 of UNCLOS. 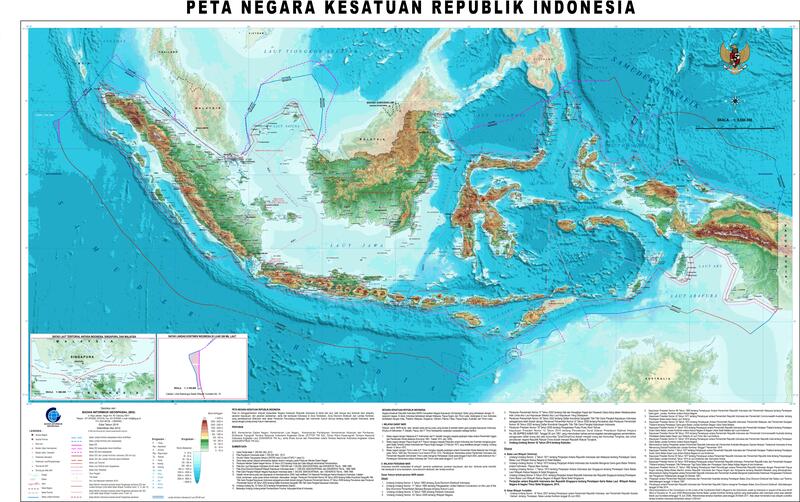 It lies approximately 173 nm from the outer limit of Indonesia’s EEZ north of the Natunas. If deemed to be an island under Article 121, China could declare an EEZ from Spratly Island that would overlap with Indonesia’s EEZ in 33,300 square kilometers of the sea. China, however, has not claimed an EEZ from this particular feature. Map showing overlap between Indonesia’s claimed exclusive economic zone and a hypothetical exclusive economic zone claimed from Spratly Island. Moreover, the recent fishing incidents did not occur within this small area. The June incident appears to have occurred right on the border of such a hypothetical EEZ. 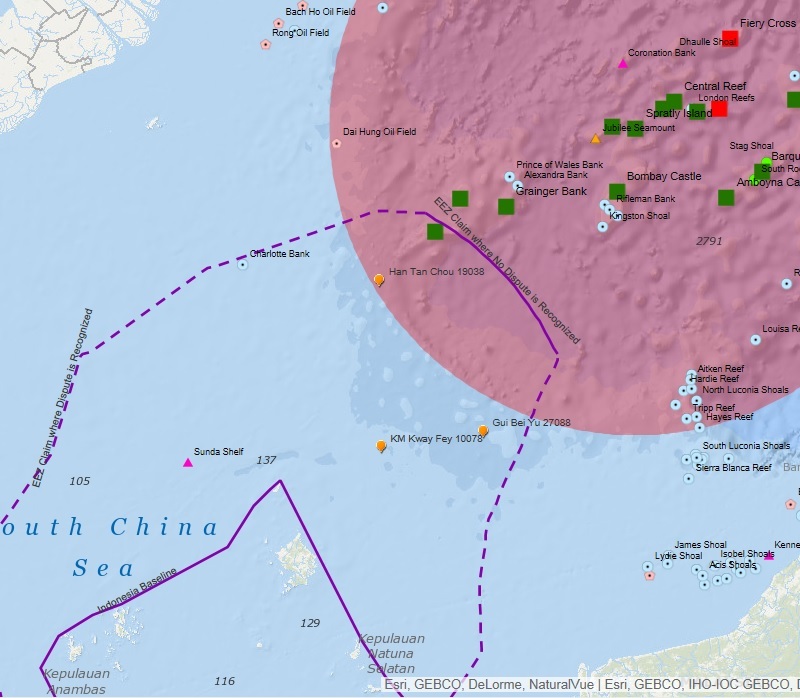 In addition, the March and May incidents took place farther south, which indicates that China’s claim to traditional fishing grounds cannot be based on any claim to an EEZ from Spratly Island. The outer limit of Indonesia’s EEZ lies more than 300 nm from Itu Aba Island (known as Taiping Island in Chinese), perhaps the only land feature in the Spratlys that could be viewed with any certainty as an island capable of generating a 200-nm EEZ under UNCLOS. Map showing overlap between Indonesia’s claimed exclusive economic zone and a hypothetical exclusive economic zone claimed from Spratly Island with locations of last three maritime law enforcement incidents between Indonesia and China. Hua’s remarks also represent a departure from past statements that indicated that maritime demarcation in the South China Sea should be based on UNCLOS and international law. In March 2012, for example, MFA spokesperson Hong Lei distinguished between disputes over “territorial sovereignty of the islands and reefs of the Spratly Islands” and disputes over maritime demarcation. He also said that “no country including China has claimed sovereignty over the entire South China Sea.” Other Chinese statements at the time indicated that China would claim entitlements such as a territorial sea, EEZ, and continental shelf under UNCLOS but did not refer to any historic rights or traditional fishing grounds. Hua’s statement on China’s traditional fishing grounds near Indonesia’s Natuna Islands remains vague and ambiguous: It could refer only to traditional fishing rights or it could refer to a broader but unspecified set of historic rights. It could refer to exclusive rights or to nonexclusive ones. It could refer to parts of the nine-dash line where China cannot claim an EEZ from an insular feature or it could refer to the entire area enclosed by the nine-dash line. Regardless, China is deviating from past practice by acknowledging a dispute with Indonesia and basing that dispute not on China’s EEZ under UNCLOS but on historic rights instead. M. Taylor Fravel is Associate Professor of Political Science at the Massachusetts Institute of Technology (MIT) and Principal Investigator of the Maritime Awareness Project. Banner image: Indonesian coast guard vessel KN Trisula participates in a marine pollution response exercise in April 2007. © TARA YAP/AFP/Getty Images.